In our increasingly mobile world, communication must be cost effective, global, and available seamlessly through multiple technologies. True Unified Communications logically blends separate services and features, making communication possible by any means, with anyone, using any of your devices. Virtual Number, our free flagship service, simplifies your personal or company's communications, while reducing costs. Virtual Number is everything combined in telecommunications: it's a pbx; personal assistant; call center; fax; call conference; call forwarder, in fact, anything you want it to be. Virtual Number is managed in the cloud, and is free to acquire and use. You only pay for the calls you make, while others call you, at standard rates. Virtual Number makes use of what you have: your mobile phone, land line, IP-Phone, soft phone or legacy pbx in most cases without the need for additional investment. Move your offices or home, change your network, your Virtual Number remains the same and your calls will follow you, wherever you are. Virtual Number is the only communications solution, you or your business, will ever need. Install our free App on your Android device. With the Greydot Mobile App you can make and receive crystal clear VoIP calls as well as trigger Callbacks via your existing provider. The Greydot Mobile App integrates with your device contacts, making calling through our network easy and convenient. OnCalls (calls to other mobile Apps) are charged at a fixed rate per call and encrypted, ensuring your privacy. Installing our App is optional but it will save you a lot of time and money as well as make your life more mobile. Virtual Number accepts multiple concurrent calls and then queues them on hold while listening to soothing music. Virtual Number will regularly provide queue position announcements while it hunts for an available agent. Agents may use our Mobile App, Mobile Phones, IP-Phones or legacy handsets connected to any network world-wide. Once they accept the call they may transfer it to any number on any device world-wide. A Number is yours for as long as you need it. It accepts your calls, without answering them, and then forwards them to where you need them to be. Virtual Number's Number is always available, ready to follow you, wherever you are, without exposing your current number. It's an ideal solution to protect your privacy or to provide a number on your business cards or letterhead that never changes, even if you change networks, your Number, will always remain the same. Virtual Number accepts high-speed faxes and send them to your email as PDFs attachments. You or your co-workers can send faxes from email or the web and then receive delivery reports via email and instant messaging. Inbound faxes are archived for 5 years and can be retrieved at any time. Outbound faxes are held for 60 minutes and can be resent with a mouse click. Create a conference room and have others join you in a call conference. 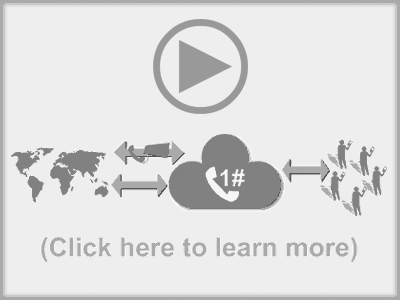 Virtual Number can direct callers from any network into an unlimited conference, all they need to know is your Virtual Number. Participants may use our Mobile App, Mobile Phones, IP-Phones or legacy handsets connected to on any network world-wide. Callers pay normal call rates. Virtual Number can accept your calls as a voicemail messages. Messages are recorded in MP3 format, attached and sent to your email. Bring your SIP-enabled IP-Phone, ATA, Mobile Phone App or PBX system and connect them to your Virtual Number. Your SIP-enabled devices are required to support G729. Optionally we support SRTP and T.38 relay.